DELIKAT ASIATISK MAD PÅ CHRISTIANSHAVN - Restaurant Goomi er en asiatisk restaurant, der ligger på Strandgade 20 i starten af Christianshavn. Restaurantens retter er kendt for deres spændende smage, priserne er ganske rimelige, og betjeningen er høflig og venlig. ET MIX AF NORDISK OG ASIATISK - Restauranten laver fusionsmad, der kombinerer det eksplosive asiatiske med det enkle nordiske. Hovedretterne inkluderer her blandt andet den thailandske specialitet tom kha gai, japansk misosuppe og diverse kinesiske retter. Derudover er der også forskellige vegetariske retter, et fornuftigt vinudvalg og dagens dessert. TAG STUDIEKORTET MED - Priserne på restauranten, hvad enten du bestiller menuer eller a la carte, er meget rimelige. Derudover får du som studerende en rabat på 10 procent på mad og drikkevarer ved fremvisning af ID. Very helpful with gluten free options. Very friendly helpful staff. The service was so personal and the red curry was amazing. God mad til rimelig pris. Super god betjening. Very good meal. Menu was short but that means everything is done with attention. And the attention was excellent. Very friendly service which felt genuine. Well cooked food which tasted yummy. Only downside was not enough desserts left for us all! Limited menu but so very tasty! Staff took time to explain what was in each dish and to make suggestions where needed. We were a party of seven colleagues for a business dinner. We had a mixed set of eating requirements of gluten-free, vegan, vegetarian and meat eaters. Goomi catered for us all in an easy and effortless way. The food was well prepared, cooked and served. Each dish for each person arrived perfectly laid out on the plate. The staff in the kitchen certainly want their dining guests to receive their food in pristine fashion. The waiter was extremely courteous and pleasant, as was the entire dining experience. 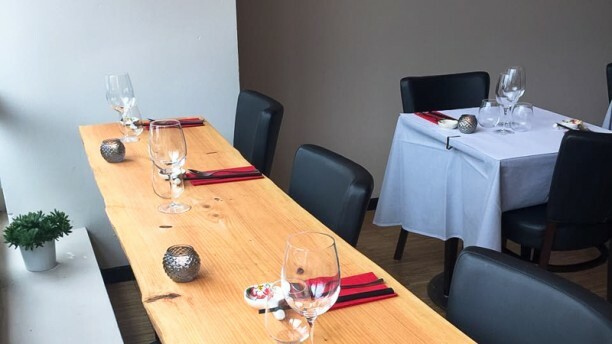 Goomi is a small intermate restaurant serving each table in a close and honest way. I would go back to this restaurant in a heartbeat. Top marks from myself and all my work colleagues! We had three starters each, instead of of a starter and a main course, the portions were big so that was more than enough. Table of Ing Ing J. Very good food. Nice ambience. Brilliant food. Superb presentation. Top taste. Will be back soon. Very relaxing and good food, and very quick. Will return again. Delicious food, great service. Loved this restaurant. Very nice and delicious asian food. Good service. Well recommended. Very interesting menu with chinese and japanese dishes and they even have Mango lassi! Very friendly service with every dish explained in detail. Welcoming restaurant with tasty food. I had scallops then red curry, my vegetarian boyfriend had gyoza and then cauliflower. Wine by the glass was good quality. It was my birthday and they gave us a free dessert which was also tasty. Friendly, tasty and quite good value for this area. Would definitely recommend. Amazing good food, tasty and nicely displaied. Gentle service. I have never seen somebody to smile ALL the time and to introduce every dish a short explanations. It looks like a family restaurant and you notice that intimate enviroment!